Duarte Pedreira is an experienced trade financier, with ample exposure to trade, commodity and working capital finance in a multitude of different jurisdictions, with an emphasis in emerging markets. He is currently the head of trade finance for the UK-based Crown Agents Bank, specialising in providing trade finance services within a correspondent banking environment to financial institutions located mostly in Sub-Saharan Africa. His previous experience includes senior trade finance roles with the Standard Bank Group, where he was Head of Trade Finance Sales at the bank’s head office in South Africa, and Head of Transactional Banking at Standard Bank’s Angolan operation. Subsequently, and prior to joining Crown Agents Bank, he was also Head of Structured Finance Advisory for Caspian Sea Capital and a Credit Insurance Underwriting Manager for AIG. 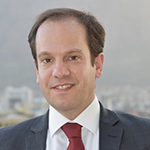 Duarte has a MSc in International Securities, Investment and Banking from the International Capital Markets Association (ICMA) Centre, part of Henley Business School, and originally got involved with ITFA by becoming a member of the ITFA Insurance Committee.